I would like you to meet Cheeco. 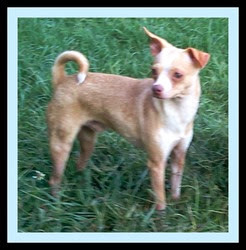 He is a little seven pound seven month old Chihuahua that was saved from a high kill shelter. At the moment Cheeco is in foster care which means he is being very socialized. He is a gem in and a half. Cheeco loves to play with toys, is leash-trained, and gets along well with other dogs, cats and birds. He is crate-trained and housebroken. Cheeco sounds like a pretty smart boy to me! If you want or know anyone who would needs a perfect little companion, please go to his Petfinder page which is here. Awww, Cheeco is a big cutie! So glad he was saved from the shelter. Sounds like he is very friendly and ready for a new loving home! Cheeco is a cutie! Sharing.